This classic and beloved Lebanese pilaf is made with lentils, caramelized onions, and rice or coarse bulgur. It’s both vegetarian and vegan. Mujadara is ultra-healthy, and is delicious topped with labneh (Greek yogurt), a fried or poached egg, arugula or watercress salad, or anything you come up with! Try the Mujadara Kit from Maureen Abood Market for excellent results! I wish I could tell you a warm and fuzzy story about how mujadara has always been a special dish in the family. Truth be told, mujadara was far from my favorite growing up. Lentils don’t hold a lot of kid-appeal, which is why I’m always astonished when my friend Rebecca tells me her children eat a lot of lentils and love them. For me and my siblings, lentils were to be avoided; we walked far away from the table when lentils were on it, like my little nephew does whenever he sees a dog nearby. You wonder where he’s going and then realize he’s circling the park, walking far out of his way to avoid that dog. It might bite. I try to remind myself of my childhood aversion to mujadara whenever my nephew looks in terror at something I’ve placed before him on his plate. Usually I beg him to at least taste it, or I ask him if he’s read Green Eggs and Ham? And he usually has a response like “eggs are NOT green.” It’s not like I’ve tried to feed him mujadara; we’re just talking about mashed potatoes, or green bits of anything in anything, or any scoop of one food touching another—and he goes kind of crazy, as though a huge, fierce dog is going to sink his teeth in and never let go. During my graduate school years, I was enamored with my first apartment and most of all with having a kitchen to call my own. I got into some heavy thinking about all kinds of things, and for a short time, swore off of meat (religion too). Mom was concerned, mostly about my ability to maintain good nutrition, especially knowing my propensity at that point to skip meals in favor of candy or nothing at all. But her response was one that I’ve never forgotten. Instead of asking me in disbelief how I would survive without kibbeh, or her all time favorite, a hamburg, she gave me a vegetarian cookbook. This was the first cookbook to don my bookshelf; it was beautiful, and I was mesmerized. It was from this book that I first made the divine smoothness of pureed leek and potato soup, and I’ve been making it ever since. She also gave me the recipe for mujadara, and told me about why it’s so good for you. The combination of lentils with rice or coarse bulgur forms a perfect protein, along with the fiber and other nutrients much needed in a diet that doesn’t include meat. Her approach to my swearing off of meat (we won’t go into what my parents thought about me dumping on my religion, which was also short-lived) charmed me into walking right up to the big bad doggie of lentils and putting the back of my hand in its face. My first tries at mujadara were just ok, producing a mush that still tasted fine but giving off an aroma from the deeply caramelized (or in my case, burnt) onions that was so strong it permeated the woodwork. I think I can still smell those early batches in my hair today. I’ve since discovered that in some areas of Lebanon, mujadara is in fact pureed, so my mush could probably have passed for something other than a mistake. And Aunt Rita casually mentioned recently that she caramelizes her onions in vegetable oil because with the olive oil, the onions burn easily and the whole house smells of it for days. A revelation. One of the great things about mujadara is that you can make it on a whim with ingredients you likely already have in the pantry. This is peasant food, food that developed out of need. 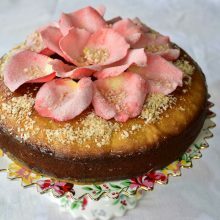 But in the hands of the Lebanese women who throughout history have known instinctively how to make all food taste good, the ingredients were transformed into a beloved dish that, approached with a little gentleness and charm, could coax even the most stubborn (albeit adult) palate into submission. This pilaf is made with lentils, caramelized onions, and rice or coarse bulgur. Try the Mujadara Kit from Maureen Abood Market for excellent results! There tends to be some question as to how far the onions should be taken in the caramelization process. They must be dark, very dark golden brown. Some of the onions will verge on burnt. But entirely burnt onions will produce a bitter mujadara and the onions won’t ‘melt’ into the lentils and rice as they should when they are soft. Mujadara is delicious eaten with labneh, flatbread, a green salad, and if you want to get fancy, some crispy fried onions strings on top. In a large, heavy sauté or sauce pan (with a lid), heat the canola oil over medium high heat. Add the onions and cook until deep golden brown, about 20 minutes, stirring frequently to avoid burning, though some charring will occur in order to get them all browned. Sprinkle with a pinch of salt as the onions cook. Take the onions off the heat and add 2 cups of water. Place back on the heat and bring to a boil, then reduce heat and simmer for five minutes. The liquid will take on the deep golden color of the onions and the onions will continue to soften. 150 Responses to "Mmmm Mmmm Mujadara, Lebanese lentil pilaf"
It seems the Lentil post , inspired you eh ? I will definitely go with canola oil next time–it is true that olive oil has a lower boiling point but I was so unconsciously wedded to it I never thought to change. Funny how that works; I hadn’t thought of changing either, even though canola has been such a revelation in the last year. Can always get the flavor with a drizzle of olive oil when it’s all done. Yes, I’m going to do the drizzle. Also, I’d never deglazed the pan after frying the onions before, and I like how that is coming out. Oh good–I think it’s the key to getting a dark brown mujadara (more appetizing) and to getting everything well-flavored with the onion! Lentils were never a favorite of mine. Could this be done with small dried beans such as great northerns or black eyed peas? Ohhh, that’s clever Roger. I bet so. The key would be to watch the cook time so the beans don’t go to mush. Let me know…. I commend your solidarity with your daughter, Greg! These lentils will be just the ticket. I just brought home a loaf of Epi from your Crooked Tree Breadworks this afternoon…I could eat the whole thing in one sitting on its own or with nutella or my apricot jam or butter…..it’s amazing. I bet those onions brought you in like the Pied Piper! Great memory. My mother talks about how they always had mujadara on Fridays too. When I was traveling in Ecuador last year, I had a great dish of lentils and rice. I wrote it down to remind myself to make it. I never did, but this recipe reminds me of it – I want to make your recipe over the weekend. PERFECT for a cold winter day! I love your photographs! would add more color and flavor. I would think that adding ketchup or tomato juice would help and might give it a little more Lebanese flavor as tomatoes tend to go into everything. This is fantastic Roger. You are a great cook, experimenting like that!! How would using brown rice change the cooking time and amount of water needed? On the stove, not in the microwave. Susannah, that is a great question. Try an additional 1/2 cup of liquid for 1 cup of brown rice (the ratio of rice:liquid for brown rice is 1:1.5) and cooking time may be 10 minutes or so longer (taste to test). I’d love to know how it comes out for you Susannah! Yes! I too was not a fan growing up but now I crave Mujadara.Great blog, traditional recipes and photos too. Thank you for beautiful pictures and perfect recipes to share with my friends. Thanks so much for that Karen! Great to see you here! We recently had this dish at a restaurant in Myrtle beach. It was the first time I had had mujadara and I loved it. The owner of the restaurant told me how to make it. She is Lebanese and uses lentils, rice and onions but only uses allspice . Most recipes also use cumin. Have you ever made it with this spice? Hi Sally–how great that you talked with the restaurant owner about how to make mujadara. We don’t use cumin much at all in our Lebanese cooking, but many regions do. And for mujadara, we don’t add the cinnamon or allspice–but for many, many recipes, we do! It’s just a matter of various traditions and tastes. Please let me know if you make some…thanks for writing! I do not believe that to be true as my family in Lebanon and pretty much every Lebanese household I have ever known goes through cumin like salt, per se. Loved mujadera even as a kid–must have been the lingering smell of the ‘burnt’ onions, in olive oil–Maureen, I was laughing hard, outloud, the whole time I read your utterly charming column. Every one of your columns evokes such tender memories for me of my beloved Mother–I always helped her spread out the lentils on the table and hand sort each lentil off the edge of the table and into the pot, so that every dreaded little rock could be culled out of the lot–yes I am older than dirt (68) so I remember this essential process. I was thinking the same thing. Being Armenian, I don’t see any depth of flavor in this recipe. I would think some cumin would be a great addition as well. How much cinnamon and how much 7 spices? I came back from a trip to Turkey with some delicious smelling 7 spices and am looking for recipes to use it in. Thanks. Hi Holly–I don’t use cinnamon or 7 spices in mujadara, but to start I would try a 1/4 teaspoon of each! What a wonderful comment! How great to hear about your experience trying mujadara for the first time, and then enjoying making it yourself!! Please keep me posted on your cooking adventures…..
My great-grandparents were Lebanese, and though unfortunately not a lot of recipes have made it through the generations, I have happy memories of what I only knew of as ‘judra’. I’m very pleased to learn that it is indeed a real Lebanese dish! My nanna also used to make a vermicilli-and-rice dish that we called sherria, and small mince balls that we called coobie. Do they sound like they might have some resemblance to Lebanese recipes? Coobie sounds like kibbee. Which is ground beef mixed with chopped green onion and fresh minced parsley seasoned with a little salt and pepper then molded into short hot dog shapes then either grilled or broiled. The rice is simply noodles browned in oil and then cooked with the rice (sort of like Rice-A-Roni). Good luck! Making this for my Lebanese husband. Hope it turns out OK…..have tried loads of things but they’re always a flop. My husband has told me to give up, but want to master this ” Lebanese Cooking ” thing. Hi Jackie–thanks for a great question. 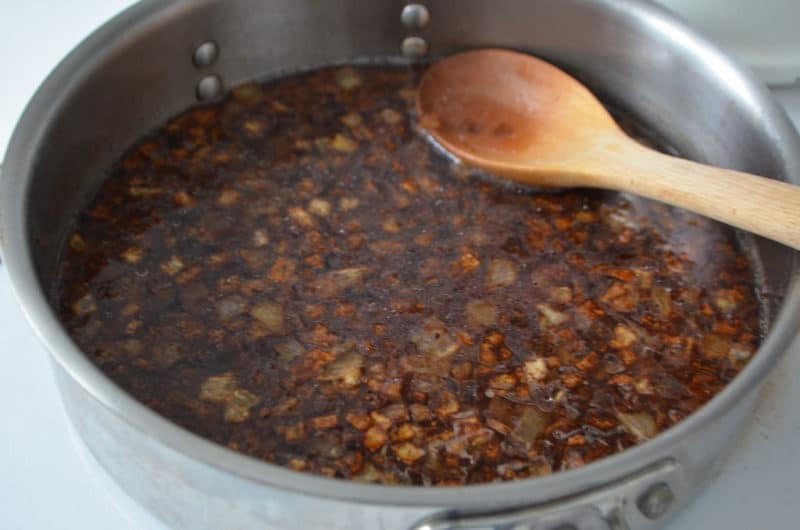 You can caramelize the onions in a slow-cooker (10-12 hours) with some broth (chicken or vegetable), then transfer to a saute pan, add par-cooked lentils and water, and go from there. I haven’t tried this, so I’d love to know how it comes out for you! Hi! I am half Lebanese and this was one of my favorite dishes growing up. I have always tried to duplicate my grandmother’s cooking but nothing ever tastes quite like hers! Most traditional Lebanese food takes a lot of time and preparation and I’m fairly lazy! I just finished using your recipe, which was very easy to follow. The end result tastes really good but, like you mentioned about your first attempts, mine was kind of mushy and some of the rice was a little hard still. Have you found a way to avoid this? I had to add more water after the first two cups because there wasn’t enough to cook the rice and it was sticking to the bottom of the pan. Either way, it still tastes yummy! The tip about using the regular oil for frying the onions was a lifesaver. I always think I have to use olive oil for Lebanese food but my onions never turned out right. This time, they were perfect! Thanks! I grew up in Maine and of course had never heard of Mujadara. I then went to law school in Lansing, Michigan and I was introduced to it by a friend. There as a great Lebanese deli type of place and I fell in love with Mujadara, Falafel, and other great dishes. The Mujadara was my favorite though. I now live in Florida and I have not been able to find any place that makes Mujadara. I can’t wait to try this recipe. Wonderful recipe! I was just wondering though, when adding the lentils to the onion and water mixture, should I add the water the lentils were cooked in too? Or should I drain the lentils first and add them without the water? Thank you Jumana–good question. Yes, add the lentil water too! how many servings are for this dish (mujadara)? following your recipe? Hi Mona–this makes about 8 servings. Hamdillah I found this. I fell in love with mujedera after having it at the mosque I converted at. I have been looking for a recipe for this ever since. Now that my fiancée is threatening vegetarianism I am glad to have found this! I applaud her for wanting to eat healthier and this will be a great dish especially as it is a whole protein. Thanks for the post!! Do you throw any seasonings into the dish? 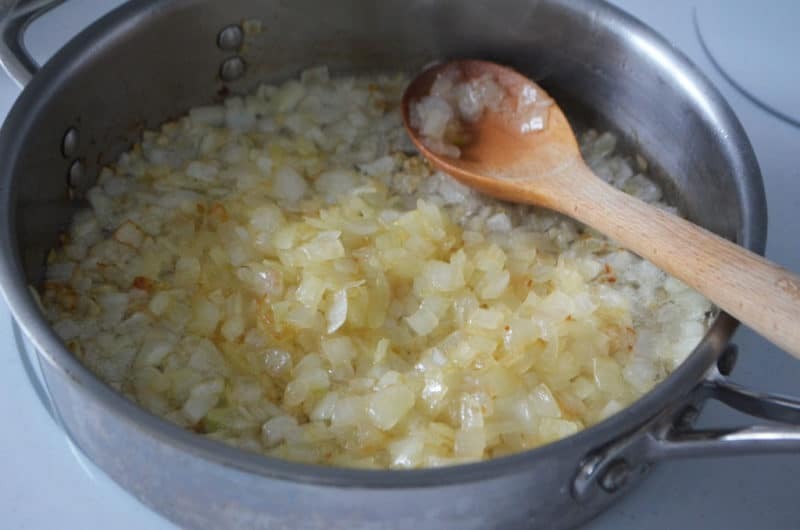 Chef tip – if you want to stop the onions from burning as they are getting close to being dark enough just add a splash of water or stock. The little bit of moisture helps to break the onions down while preventing them from sticking and therefore burning to the pan. Greg, thank you–there are many ways to season the mujadara; our tradition is salt and pepper only for this but many use allspice, cumin, cinnamon or other seasonings. There’s a small Mediterranean grocer and deli down the street from me here in Oklahoma City, which is where I first tried mujadara. (I might add – there seems to be a hundred different spellings for the dish: this place calls it ‘mujadra.’) I’ve always wanted to attempt to make it at home, and somehow found my way to your recipe. I tried making it tonight, and while it tasted great (much like the deli I love – minimal seasoning; I’ve never detected cumin or any other spice in their version, for what it’s worth), I ended up with some less than desirable textures, with the rice being undercooked and the rest being mushy. Towards the end of the cooking process, just before the boiling point for the rice, it started to stick to the bottom of the pan and burn, and all of the liquid was absorbed way too early. I added another cup of water, but by then it was too late. Any suggestions? Mujadra is one of our favorite dishes.My husband loves his plain and my kids and I love addind lemon juice to ours. I have eaten majdra all my life and loved it as a kid but have never mastered the onions either…can’t wait to try the canola oil. what is it about fridays that make us want comforting carbs? bulgar wheat is an absolute! Not rice! Hi Chris! I use the same amount of time for rice or cracked wheat. Bulgur has about 5-6 grams of protein in a cup (cooked), whereas rice has about 4 grams. This was lovely. Thank you for the recipe. Son #2 ate three helpings (he’s four). We have many friends in Harbor Springs. Great to find your blog. Thank you Kate, and how nice to see you here! That four year old is fantastic! Thanks for sharing this recipe! I tried it out tonight and my mujadra was *so* much better. I usually end up with the burnt-onion mush! So glad to hear that Rebecca! Just made this today for tomorrow – can’t wait to taste it after it’s had a chance to set a bit! I found your blog through a comment you made for a similar recipe in Food52! I’ve made the yogurt Rivka suggested, but followed your recipe exactly! Can’t wait to explore your blog a bit more! Thank you for sharing! Cassandra, welcome–I look forward to seeing you here! Thanks so much, and enjoy your delicious mujadara! Hi Maureen — I’m Lebanese and I too have fond memories of cooking with my Sitto’s and mom growing up. I’ve perused many of your posted recipes and they are as close, if not exact, to the way my family has cooked these dishes. There can be so many variations with different spices and so forth, but yours resonate “home” to me. Last night I made your mujadara recipe….it was superb! Thank you for your posts and for sharing these golden recipes with us! What a treat! How special, Jodi! I’m so happy to know that we share a similar approach to our Lebanese dishes. Thank you for sharing and please do keep in touch! My husband is Lebanese and prides himself on his traditional cooking. Most is just fine although when it comes to his mujadarah he refuses to listen to me about the cook time and the fact that he mashes them to a pulp! He insists this is the way his mother did it. Please tell me this is done in some regions, I really prefer them not mashed, and not pulverized, and wish I had a fact to rely on to prevent his devotion to the blender! Hello Donna! I have seen some recipes that do make the mujadara pulverized, so I can see how it may be that your mother-in-law made it that way–BUT, the other version, like mine, is the only way it is prepared in my extended clan and by everyone I know who makes it! Hello! I am 2nd generation Lebanese and my Sittie made her mujadara with rice and it was very mushy, just like a porridge (oh, how amazing it was!) with the sautéed onions on top. Although many in family would joke that the mujadara was POW (prisoner of war) food, it was the most amazing dish ever and I looked forward to that meal every Friday evening! I lived on 26th St and Lexington in NYC for 20 years and loved every minute of my years in “little Pakistan” eating curry and the like 3-4 x a week. My almost daily stop was Kalustyans a fabulous Lebanese spice store that offered the most amazing mujadara ever. So good that I dared not try to reproduce it when I moved away years ago. I have never seen it made with Bulgur which is the way that they made it on Lexington Ave. This is the closest and most delicious I have had in years…thanks for this great recipe!! That’s great news Joan, thank you! And a great memory of your mujadara at Kalustyans–I’m a big fan of their online store for so many great imports. Can you used canned Lentils? I love this dish… so simple, but so delicious. Hi Mona–I have never eaten canned lentils! My only concern is if they are very soft out of the can, they may overcook in the mujadara. If you do try it, skip the par-cooking of the lentils, and add the drained canned lentils when you add the rice or bulgur. You’ll only need enough liquid to cook the rice or bulgur, since the lentils are already cooked. Freekeh mujadara sounds delicious–clever!! Nice with the lemon juice too; I often eat mujadara topped with an arugula salad dressed in lemon vinaigrette. Saw this in a cookbook and quickly snapped a high rez pic and made it today. The caramaleized onions will really transform this dish, I think, from mundane to marvelous…just a feeling. It’s cooking now. This recipe also contains toasted almonds, sliced dried apricots, but no cumin or middle eastern spices. Odd. But still–it smells delightful. Just checked and the rice isn’t quite cooked, so I added a bit more broth and a bit more time. Hopeful! Delicious! Our traditional mujadara is not heavily spiced, salt and pepper only. But nice to experiment! I may try variations later,but this is a good basic recipe I will cook. Good staples to add to my emergency pantry foods too! like the kids enjoyed it. Having it for dinner. Thanks for sharing. What a great meal with a salad and perhaps some bread. Can’t complain about the cost either! Found you looking for this recipe. Staying to check out more.Could you make the lentil burger a print/pdf? Been saving recipes to the phone. Wonderful Sally, and yes, I will get after the PDF! Thank you! Thank you for your comprehensive recipe. I only had green lentils and was looking for the best recipe and yours is the authentic deal, I spent 30 minutes finding the right one. Moujadara was always my favorite meal as a child, we had it with salad my other favorite food. Well lebanese style salad_The best. Haven’t had Moojie (our nickname for it growing up) in decades! Thank you Maureen. Gotta go and start carmalizing the onions. I’m so glad you found this Lalia! Thanks so much for taking a moment to comment. Enjoy the Moojie! My mother was an awesome Arabic cook and I liked just about everything she made EXCEPT MUJADARA! Lately I bought it already prepared at a Middle Eastern Grocery Store.and loved it except that, in my opinion, it was too oily. So in looking for a recipe, I found you web site. I really enjoyed reading how you too disliked Mujadara as a child. My mother made a fantastic lentil soup that I’m going to try. Glad I found you and your recipes. That is great!! I think this version will win you over (not at all too oily), and your lentil soup sounds like a winner too…. That’s a fantastic recipe for the much appreciated mujadara. May I add a little detail about a “side” dish that can go well with? In Tripoli (Lebanon) where I grew up, it is usual to prepare a side dish by combining yogourt (laban) with diced cucumber (peeled and core removed), plus a sprinkle of dried mint leaves on top. It seems to balance the “dryness” of the mujadara. By the way, the core of cucumber is not to be wasted: it has a cooling and refreshing effect and can be used as a quick mask. Thank you so much for this recipe! I was looking for a recipe to recreate the lentils and rice dish with lamb fillets that I have had at a local Lebanese restaurant. These lentils are spot on! I did add the cinnamon as I recalled that flavour. Thank you, thank you, thank you – I can’t wait to explore the rest of your recipes!! That is so great Shell!! I’m so happy you can make this at home now!! Thanks Maureen, there’s a way it’s done with a pressure cooker, it comes out like porridge and is cooled in individual plates where it gels. I don’t know how it’s done, but I like the texture and taste more than this one. I reduced the onions by half here, still you’re recipe is simple and great. I always loved Mujadara – my mother never had to twist my arm to eat it, My family ate it by scooping it up with big pieces of onion (and that’s the way I still eat it) and of course Syrian bread. Love your photos and story, as always. I am a vegetarian of Gujarati origins; very lucky to have had friends from many parts of the world with whom I ha;ve cooked and created recipes over 40 years. Internet has made it possible to “meet” people like you who inspire me to keep experimenting. Gujaratis cook “khichadi” which uses rice and daal (split legumes e.g. moong, various types of lentils, gunga peas, etc.) and whole spices such as cumin seeds, peppercorns, cinnamon stick and cloves, turmeric, etc. I have experimented preparing mujadara with all kinds of grains as well – short-grain brown rice, wild rice, green wheat, quinoa, etc. as I have got older and mindful of need to eat less acidic foods. I have also used beetroot and wild greens to create nutritious stocks which happily add variety to taste and colour. Nature is so generous with its wild bounty! The question is : in doing so, what about the original name? Does it matter? Thank you so much for this recipe! A little family owned resturant I used to frequent made this as a special and it quickly became my all time favorite dish. They closed 10 years ago and I have been searching for a recipe ever since. I’ve made so many that were not even close. Twice I’ve found it in other restaurants but it was never as good. This nails it. Now I can have my favorite dish whenever I want and I cannot tell you how happy it has made me. So far I’ve made it 5 times and every time I get it better. Thank you for this recipe, Maureen! We are lucky to have access to a lot of middle eastern restaurants where I am in Southeast Michigan, which prompted my love for all of these foods. I recently realized that I love to make all things from scratch (mostly ends up being Italian food because I grew up in a big Italian family) but I rarely make these middle eastern gems at home. There are so many great spots in metro Detroit, but I want to be able to make it at home like I do with other favorites. This recipe is just what I was looking for (particularly with bulgar wheat rather than rice, since that’s how I prefer it). Hope you are well, and I know the areas you speak of well, we vacation “up north” and frequent places such as Traverse City, and I went to law school at Michigan State up in East Lansing. 🙂 Thank you! I just made this mujadara, never heard of it before, found the recipe thru Pinterest. LOOOOOOOOOVED IT!! My daughter ate all of it! From Venezuela, thanks for the story and recipe. This looks just like the mujadara that from one of my favorite restaurants! I want to try this recipe without rice, how would you suggest adjusting the recipe in this case? Maybe substituting a 1:1 ratio of the rice for more lentils? Thanks! Jessica, if you don’t want to use rice or bulgur (I love it with the bulgur! ), you could double the lentils instead. I’d love to hear how it goes when you try it! The texture may be a little different without the starch but I bet it will taste wonderful. Just cooked this for the first time-awesome stuff! Only problem was my onions were melting away before they really carmelized…my version included star anise and all spice, but no cumin. I could eat it either way. Kind of reminds me of hoppin’ John from South Carolina! Your version of mujadara sounds delicious Cynthia! Maybe chop the onions more coarsely and see if that helps. I made this today exactly as written and it is delicious! Terrific recipe and now we want to eat it all the time. Thank you! Thank you Melissa! This is such a delicious and healthy dish to add to your repertoire. Hi Maureen…Mujadara was a staple in my home when I was growing up, as it is now. My Syrian Mom always used brown lentils and rice, cooked together as a pilaf. She caramelized the onions and garlic on the side (crescent moon slices, the bigger the better! ), then added the onions to the pilaf at the end. We serve it with a large dollop of laban or Greek yogurt, salt and pepper. It freezes well and I always make a double batch to have leftovers. Whenever I visit my brother’s family, I make a batch for them and they love it…it brings back good memories! As a vegetarian, it has kept me rooted to my heritage as well as provided a great low-fat, vegetarian meal. Thanks for highlighting it in your blog! My mom always makes it with crescent moon slices, just as you describe! I’ve never frozen mujadara and am happy to hear it works. I will do it! Hey Maureen! This was the first Lebanese dish I learned to make. It is also my absolute favourite. I actually grind up the onions in a food processor because my boys when young insisted “we hate onions” but you can’t get the flavour of Muddudrah/Mujudra without the onions so they never realised there were onions in it. As you know, each Lebanese family has its own way of making a dish so it’s good to see how your family makes it. Your pictures are also so inviting! Love it, thank you Libby! Thank you, Maureen, for this beautiful recipe. I haven’t been able to taste mujaddara since moving to Texas from NYC (Kalustyans served an amazing one) five years ago. This one was divine! Really nice and specially delicious. I have to do it! I love this recipe and your site! The foods have such a bright and fresh or warm and homey flavors. I grew up eating Lebanese food, although I’m not from a Lebanese family. These foods really remind me of my childhood so much. Would it be possible to substitute quinoa in place of the rice? Do you know how that change may effect the amount of liquid needed? Clever, substituting quinoa for the rice or bulgur. I haven’t tried this! I would treat the quinoa the same way you do when you cook it alone (same liquid-to-quinoa ratio, plus the 1-1 liquid for the lentils). Let me know how you like it if you do! 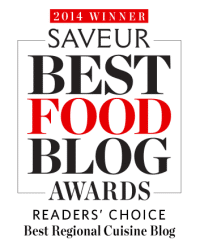 Hi Maureen I LOVE your website, amazing food with great stories. I am half palestinian and half lebanese, and just a trick, you can add a little cumin to this for taste and to ease off the stomach bean gas. Usually we put cumin (just a pinch ) on anything with beans. Thank you Nadine! So great to connect with you! I am so glad you have a website to feature Arabic cooking! I am Palestinian too and went to school in Beirut. I do add spices to the Mujadara, such as, cinnamon, allspice, coriander, cumin and turmeric. The spices make it very tasty! I love this dish and am making it again this week. My 4 year old daughter devours it! I would mention for rookie cooks (like me!) that it is best to carmelize the onions in a stainless steel pan for the best flavour. Also, it took me a LOT longer than 20 minutes to get the deep carmel colour for the onions (closer to an hour). Thanks for this great dish and a lovely introduction to Lebanese food! Maureen thank you so much for sharing this recipe – this is one of my favorite foods that my mother used to make! 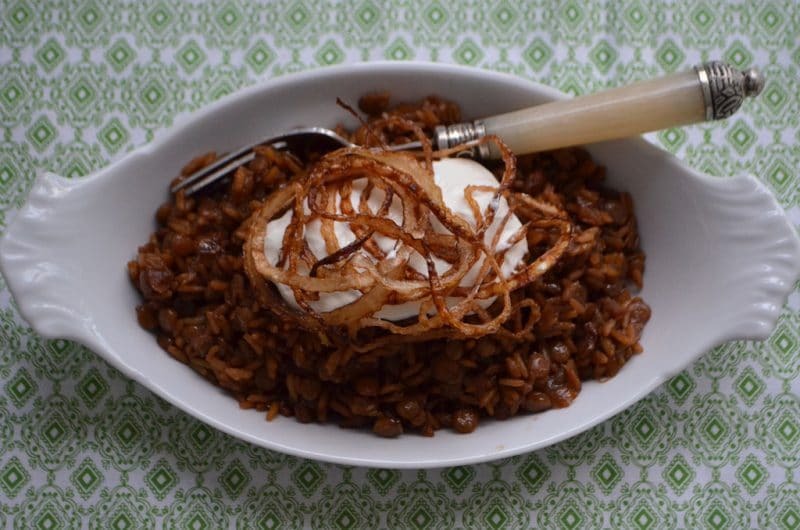 I cannot wait to try it, I have the lentils and the cracked wheat I just didn’t know what to do with them… you explain everything so well I am sure I can make this! So happy to hear this Lorri! Thank you! Love your blog. Very innovative. Please allow me one remark. Your recipe is for Mudardara not Mujadara. The difference between the two? The amount of rice you add to the lentils: in Mujadara, you put less rice and in the final result you do not see it! Thank you very much Wadad! Must be to do with the cooking over the generations here in the U.S. as even our restaurants call this mujadara! I have a question, my son has food allergies and cannot eat Peanuts, treenuts, chickpeas, lentils, green peas, and sesame. Yes I know it’s awful. Just wondering if you know of any substitute for the lentils in this recipe? 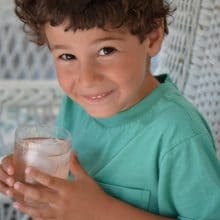 I am greek, and grew up with syrian/lebanese friends and love both food cultures although now avoiding the foods my son is allergic to has made enjoying those dishes with my family difficult at best. Thank you in advance for any help you an offer! Hi there–wow, that’s a challenge. You could make this with all bulgur or all rice and leave out the lentil. It will be delicious with the caramelized onion! Wow, well thank you so very much! A staple in our family… especially during Lent. You are so right about serving with green salad, laban, crispy onions and flatbread, that is my absolute favorite way to have this dish. We also add some cinnamon and a little cumin when cooking, it makes the dish so fragrant and cinnamon compliments the lentils so well. I love that idea. Doing it next time!! Thanks Christine! 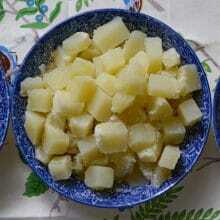 Hi Maureen from Cyprus, we also make Moutjentra! The difference being that, the onions ,are cooked separately from lentils and rice mix,in another saucepan, and cut into thinish wedges and sautéed in lots of olive oil, more than you would normally use, until softly caramelised, i.e., slow and low to start with, when onions are soft ,medium high until caramelised . 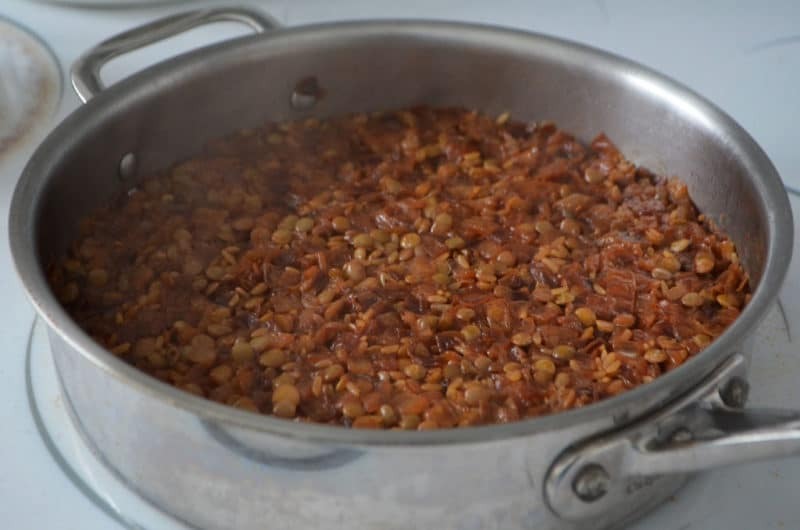 The use of a lot of olive oil here , is that it acts like a sauce to amalgamate the 2components of lentils and rice-and the caramalixed onions ,together, when they are both cooked and ready . Simultaneously,the lentils are cooked with enough hot water, as to cover them, in another saucepan, in an all-in one-pan ,method ,when brown lentils are al dente, we remove most of the water from saucepan ,then add enough hot water to cover lentils again by 1/2 inch or little more, when this comes to boil again, the washed rice is added, stirred and cooked on a low simmer, covered with lid ,until all juices are absorbed, and rice is puffed up with lentils and cooked. Now the magic starts…you have both saucepans in front of you, 3/4 of the caramelised onions are added to lentil-rice mix ,salt is added, and for us in Cyprus the juice of 1 lemon, or to taste, is added,according to the amount of lentil added in the beginning .Gently , this is mixed for flavours to mingle, only just, and seasoning checked. Wow Mairi, thanks so much for sharing your Cypriot moutjentra! I can’t wait to try this and especially excited to add lemon for delicious flavor. I am laughing because Mujadara was always (most always) our Friday night Lenten dish and we kids HATED IT!!!!! How did I end up loving it as an adult and my kids beg for it ???? I laugh when I see it in the NYC specialty stores selling for $11.99 per pound…LOL! Farah, thanks so much! I am going to try your brown rice mujadara method–can’t wait! We just made this yesterday and while us grown ups like it a lot, my 20 month old daughter basically inhaled her plates one after another calling for “more”. Thank you for this recipe! Fantastic, thank you! Smart baby! I am using coconut oil…it is carmalizing the onions nicely! I’ll try it Jennifer, thank you! I’m not Lebanese like many of you, but mujadara has been one of my favorite recipes for years, now! At times, I’ll experiment with different spices, with/without the onions, etc. It freezes well, so I almost always make a big batch (2 C lentils + 2 C brown rice, or more) and freeze it in small-ish containers. That way I can pull out and defrost them one at a time. Non-traditional, but one thing I’ve done if, for example, I come from work hungry and want something in a hurry, is to put some cooked mujadara in a microwave-proof dish, top with a slice or two of good cheese, and “nuke” it. BTW, the yogurt (or cheese) adds to the complementary protein in the lentils and rice to make it even better. 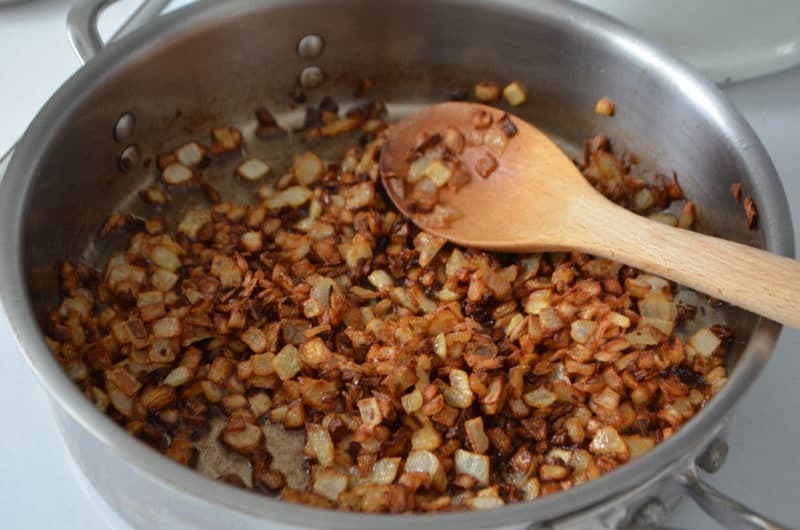 • caramelize lots of onions. 3 medium to large, and chop roughly. Fry first in canola oil, then when finished, reserve enough in a small bowl for a garnish, drain the oil in the pan and replace it with an equal amount of EVOO. • add lentils and enough water to complete cooking them (about 1 1/2 cups.) cover the pan. • stir, check for salt and pepper, garnish with reserved onions, and serve. Nice! Very similar, you’re cooking the rice in advance rather than the lentils. Thank you for sharing your method! If I use cracked wheat, do I still add as much water as if using rice? My kids love mujadara. It started while I was pregnant with my weekly lunches at Woody’s Oasis. Since then I have been trying to reproduce their flavor without success. I plan to give it a try now that I have your step by step instructions with pictures. Thank you. Oh great Sandra–I think you will love this recipe for mujadara! Use the same ratio for bulgur as you do rice, yes. For a little dryer texture and to ensure absolutely no mushiness, you can hold back on about 1/4 cup of the water overall. Let us know how it goes! Hi Eileen! You can warm the mujadara on the stovetop over low heat, stirring frequently and adding just a spritz of water to keep it from sticking or drying out. Or, reheat in the microwave in short bursts, stirring between. Ohhhh your version sounds wonderful Kat!!! Love the idea of adding laben on top! Also, didn’t realize that burning onions to a crisp (like we usually do) could leave a different taste. Going to try this way too. Thanks Maureen! Wonderful recipe..My family has been making this for decades. I do feel impelled to mention, however, that Labneh is NOT Greek yogurt! I can send to you the real recipe for labneh..from Beirut..in case you do not have it. David, thank you–and agreed, that would better read “OR Greek yogurt”! It is a decent substitution if someone is not able to find or doesn’t want to make labneh. I share your dedication to the nuanced differences! My recipe for labneh, which I love to make weekly, can be found in my cookbook as well as here on my blog, and more details here. You’ll find my recipes using laban and labneh all over the place and photographed on my social. I’d love to your recipe too if you’d like to share that via email! Love your cookbook and the blog and the great stories. I am Lebanese and didn’t like Mujadara as a kid. Now love it and this is exactly the way it is made in the Oklahoma City area where I live. Just came back from the Middle East two days ago with a renewed love and commitment to doing things the old, slow ways. Thanks for reminding me that we have a great heritage and part of honoring that is continuing to make the food we are known for. Thank you so very much Sissy. I’ve been looking for a mujadara recipe forever, but not just any recipe…..it has to taste like Woody’s mujadara. I knew your Uncle Fred. I had the privilege of eating lunch with him at Woody’s Oasis in East Lansing every now and then, usually on a Tuesday or Thursday. That’s when kibbe nayah was the special. Anyhow, Fred introduced me to Lebanese food and I’ve been hooked ever since. Mujadara is a favorite. Your recipe looks perfect. That’s so special Jaye! Hope you enjoy this recipe, so very very good. Good recipe…But why do you not use any spices…cumin …etc? My family always used spices. Well I sure have learned that every region and every family does this recipe a little differently. Mujadara is delicious with spices too! My recipe reflects how my family makes it, which is also how the Lebanese restaurants in our area serve it. hi Maureen! Thank you for providing a basic recipe that most closely resembles my mom and grandmother’s, from an ingredient perspective. Looking back over the comments I’m about 6 years late to this party, but I find it interesting how different areas flavor the dishes With their own flair. Cumin was never big with our family, but I taste it in many of the foods we get eating out at middle eastern restaurants. Always nice to try a new spin, but yours is the “judra” I grew up with, and I’ll be making it tonight!. Thank you! Agreed, the various spice-ways are interesting yet we always want what we’re used to…it’s comforting and wonderful! Thank you Bob!